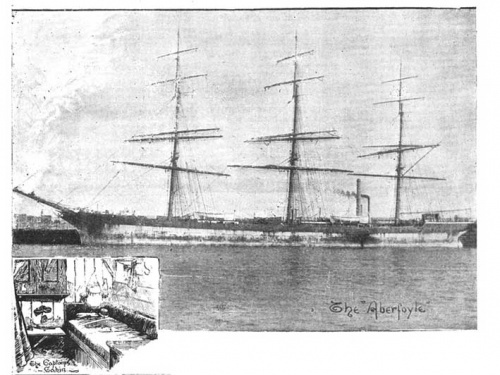 Thomas Wheatley sailed to Australia on the Aberfoyle. Mr. Thomas Wheatley, one of the last remaining pioneer residents of this district, died, at his home in Terang on Saturday last at the great age of 90 years. The late Mr. Wheatley, who was hale and hearty until a lew weeks ago, was born in Middlesex, England, in 1827. For some years he led a sea faring life and during the forties, in Her Majesty's frigate, The Portland, he visited all the then known islands in tho South Seas. In 1854 he came to Australia as a member of the crew of the sailing ship Aberfoyle. Landing at Geelong, he and several others obtained their discharge and made their way to the goldfiolds. They arrived at Ballarat just at the time of the Eureka Stockade riots. Instead, however, of stopping there, the party went on to Creswick, and then, returning again, they took roadmaking work near the old Burnt Bridge. Subsequently Mr. Wheatley went to the Barrabool Hills (near Geelong) and shortly afterwards made hid way to Timboon, as Camperdown as known in those days. At Timboon he got work on a dairy, but, as he used smilingly to relate, when the cow got her head out the bail and upset every thing, the lady who had the dairy thought him no milker and they parted company. Pushing his way further west, Mr. Wheatley came next to Eddington station, then owned by Mr. Craig, father of Mrs. Stewart Reid. On Christmas eve of 1854 he first set foot on the soil of Terang, and made his camp for the night in on old sheep-wash hut belong ing to Keilambete station, which occupied a position just behind the site of the Present Public Hall. The hut consisted of four posts and a roof. There were no other buidings in Terang at the time and the late Mr. John Thomson's Keil ambete House, then of course a very small one, was the nearest residence. The McNichlls had resided previously at Terang, but at that time they were working on a dairy at The Sisters. Continuing his journey, Mr. Wheatley made his way towards Warrnambool and calling at the Yallock station he ate his Christmas dinner there, and also obtained employment which lasted for several months. When Mr. Ainsworth, the surveyor, came to the district, Mr. Wheatley joined the party, and helped in the survey of the township of Terang, the Big Bend, and many pre-emptive areas between the Hopkins and Emu Rivers. Soundings of Lake Terang, taken during the course of the survey, showed a depth of twenty-one feet all over. A fine belt of ti-tree which partly encircled the lake and almost concealed it from view, abounded with wallaby. The sheep from all the neighboring stations were washed in those days just below the site of the Public Hall, and the surveyor and his wife took up their residence on the brow of the cemetery hill. Aftor severing his connection with the survey party, Mr. Wheatley was mar ried to Miss McLaughlin, and having purchased a fine team of bullocks, he established himself as the first carrier in Terang. For many years he conveyed goods from the ports of Geolong and Warrnambool, along the unmade and often almost impassable roads of the Western District. From the time of his marriage, Terang had always been bis home. The family, of whom eight are still living, were all born in Terang, and the oldest daughter, Mrs. King, was the first white child born in the township. For close on thirty years, Mr. Wheatley had been an earnest mem ber of the Salvation Army and one of its most devoted and energetic workers. In Army circles he was familiarly known as "Dad." He was well known and held in very high esteem throughout the district for his industry, probity, and uprightness of character. His widow, who died about three years ago was a native of Kilkenny. She came to Australia in the same year as he did, and they first became acquainted at the Yallock station. The surviving members of the family are Mrs. King (Terang), Mrs. F. Bannon (Terang), Mrs. G. Young (Powelltown), Mrs. S. Hardy (Footscray). Mrs. P. Tully (Terang), and Messrs. Henry (Terang), Charles (New Zealand), and Thomas (Terang). The funeral, which took place yester day, was largely attended. Tho Salvation Army band and members of the local corps marched before the hearse, fpaying and singing well-known Army hymns and at the graveside in the Terang Cemetery further hymns were sung with band accompaniment. The burial service was conducted by Ensign Smith, formerly of Terang, who came from Ballarat for the purpose. as "Dad."